(AP) VATICAN CITY - The pope's butler was formally questioned Tuesday in the investigation into the leaks of the pope's papers, a scandal that represents one of the gravest security breaches in recent Vatican history. Paolo Gabriele was arrested May 23 and has been held ever since in a secure room inside the Vatican gendarmerie building, a four-by-four meter (13-by-13-foot) room with bathroom, desk, bed and a crucifix on the wall. He is accused of aggravated theft, and if convicted could face from one to six years in prison. Paolo Papanti-Pelletier, a judge on the Vatican tribunal, told reporters that Gabriele had been questioned by the investigating judge Tuesday morning in the presence of his two lawyers, the first such formal interrogation that could lead to an indictment or the dropping of charges. The leaks scandal has convulsed the Vatican for months and resulted in an unprecedented investigation into who was responsible. Gabriele was arrested as part of the criminal probe, but a commission of cardinals is also investigating the origins of the scandal, and the Vatican secretariat of state is trying to solve the whodunit as well. Vatican documents leaked to the press in recent months have alleged corruption in Vatican finance as well as internal bickering over the Holy See's efforts to show more transparency in its financial operations. The scandal took on even greater weight with the publication earlier this month of "His Holiness," a book that reproduced confidential letters and memos to and from Benedict and his personal secretary. 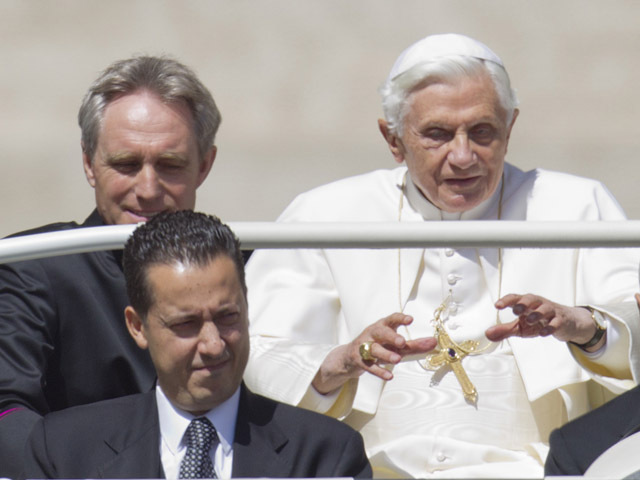 Taken together, the leaks have seemed aimed at discrediting Pope Benedict XVI's No. 2, Cardinal Tarcisio Bertone, the Vatican secretary of state, who has been criticized for shortcomings in running the Vatican. The book's author, Gianluigi Nuzzi, has said his sources numbered more than 10, and there are questions about whether Gabriele acted alone. He has promised to cooperate with investigators, and Tuesday's interrogation represented the first time he might have named names. Papanti-Pelletier, the judge on the tribunal who is not involved in the case, said that while Gabriele was charged currently only with aggravated theft, prosecutors could add on other charges in the Vatican's penal code, such as being part of a criminal association, receiving stolen goods or revealing state secrets. Those charges carry a maximum of one to five years. Gabriele can be held without being indicted for 50 days, with an extension of an additional 50 days if the investigation proves particularly complicated, he said. Papanti-Pelletier described the Vatican's legal system, which is based on variations of Italy's penal and civil codes dating back to the 1800s  with a few modifications. Like Italy, there is the preliminary trial level, an appeals court and a high court, the proceedings of which are open to the public. Unlike Italy, though, if a cardinal were to be put on trial, he would only be judged by the Vatican's high court, which is presided over by three cardinals. As princes of the church, cardinals can only be judged by fellow cardinals and the pope himself, Papanti-Pelletier said. As such, they skip over the primary and appeals court, which aren't presided over by cardinals. As in most countries, the head of state  in this case Benedict  can intervene to pardon someone found guilty. Technically the pope can intervene even before the trial begins, but Papanti-Pelletier said the norm would be for a papal pardon to come after a possible conviction. Papanti-Pelletier also described Gabriele's holding facility, saying it wasn't a cell per se but one of four secure rooms in the Vatican's main police station. He said Gabriele had access to newspapers but doesn't have a television in his room. He was escorted to Mass at a chapel inside the Vatican walls on Sunday and eats the same food as Vatican police, he said. In theory, there could be two possible investigations against Gabriele and any possible collaborators in the papal leaks scandal, since Italian magistrates could be called into investigate if any Italian citizens were involved or if any crimes were committed on Italian territory. There also remains in effect in Italy a 1929 provision that criminalizes offending the pope, Papanti-Pelletier said.